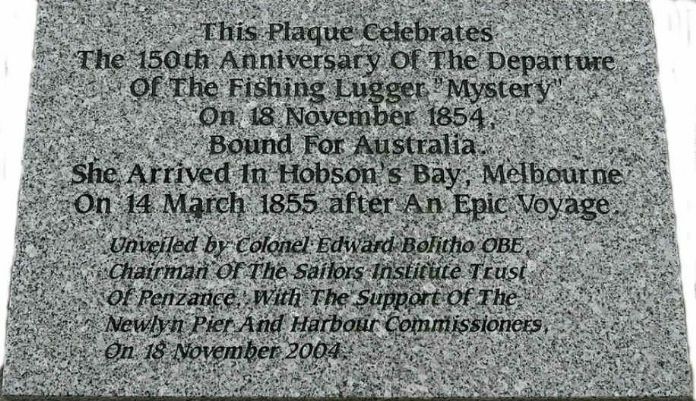 The gold rush to Australia tempted seven hardy Newlyn men to set off in the little 16-ton lugger Mystery on November 18, 1854 to Melbourne 12,000 miles away: they achieved it in 116 days. Peter Goss recreated the voyage in 2008-09 in his replica Spirit of Mystery after opening the annual fish festival in Newlyn. The link between Australia and the Star Inn on Newlyn’s Wharfside explains why the seven young men hatched the audacious plan of embarking on the long hazardous voyage to Australia. John Sullivan and his wife Mary Kelynack were landlords of the Star. Both had visited Australia and spoke in glowing terms about its opportunities. The seven young men were shareholders in the Newlyn-built fishing lugger, Mystery (PZ 233) at a time when fishing did not pay its way. Most of the young men were related to Mary Sullivan. Job Kelynack (a sailor by trade) was her brother; three others were married to three of her sisters − Richard Nicholls (a master mariner from Hayle), married to Victoria Kelynack, William Badcock married to Harriet Kelynack and Richard Badcock married to Nanny Kelynack − and Philip Curnow Matthews was her first cousin. Of the 7-man crew that sailed to Australia only Charles Boase and a Penzance man named Lewis were not close kin. There was another connection with the inn keeping trade, in that John Downing, a local businessman, offered two hundred pounds to finance the trip. John Downing was a retired brewer, having been a partner in the brewer’s firm, Gurney & Downing. According to Cordelia Dobson, there was great merry-making at John Downing’s home, Vine Cottage in the Coombe, on the eve of the departure, with local gentry and leading men of the village gracing the convivial occasion. Preparations for the trip became widely known in England, as there was a report in the Times. Cordelia Dobson’s recollections (reported in Batten, 1980:13-14) were that ‘hundreds of people flocked to the banks of the Coombe river’ to see it off. A rather different story from Patience C Humphrys, who was the granddaughter of William Badcock, says that it left on Saturday November 18 at 9 am, ‘when the British nation had its thoughts on the Crimean War and had no time for fishermen heroes’ (Humphrys, 1976:2). Most agree that the provisions taken on board consisted of salt beef, pork, hard tack (ship’s biscuits), and fresh water. There was also an Octant, and more personal belongings including a small gilt-edged red-covered book, about five inches by three inches, 240 pages titled Christ Precious and a gold ring (now part of the Charles Boase family collection). The Mystery reached Melbourne 116 days after it left Newlyn. Although a meticulous log was kept of the voyage (a copy of which is in the Royal Institution of Cornwall Museum Library), little was written by the crew about the voyage, perhaps as Douglas Williams suggests in his article ‘Enigmas wrapped within a Mystery’ (Cornishman 23/10/2008), because they lacked the literary skills needed or they were disenchanted with the whole adventure, sick of each other’s company and desperate to get home. They were eight days from England to Madeira and on the 35th day out they made the Island of Trinidad. On the morning of the 17th of January 1855, they arrived at the Cape of Good Hope, being 50 days out. On January 24th at 6 p.m. they got underway from Cape Town and proceeded on their voyage with H.M. mails on board. Nothing interfered with their progress until February 18th, in lat. 40.5 south, long. 82.25 east, where they encountered a very heavy gale, which necessitated them riding to a raft for nine or ten hours. Riding to a raft is a system adopted for safety. Ships heave-to under such circumstances. On February 23rd another heavy gale visited them in lat. 39.57 south, long. 98 east. They again rode to a raft for four or five hours. On the 5th March they met with another very heavy gale in lat. 40 south, long. 129.19 east, which compelled them to ride to a raft for 12 or 14 hours. The weather was pretty favourable after that date until on March 14th, 1855, when they cast anchor in Hobson’s Bay, Melbourne, thus accomplishing the voyage in 115 days, including seven days stoppage at the Cape of Good Hope, where they put in for a supply of water. Of the seven men who came to Australia, five returned to their native home. Job Kelynack a bachelor lived in the Fradgan and died in Cardiff in 1903; William Badcock lived in the family home at Orchard Place with his wife, four daughters, and a son. He died in 1906, aged 85 years. William and his brother had returned to fishing in Newlyn, after first working as warder boatmen in the prison hulks in Melbourne harbour. Things had not gone so well for Richard Badcock and Charles Boase, who both died in 1874, or for Richard Nicholls, who was knocked down and killed by a brewer’s dray in London in 1868, or for the Mystery, which was sold in Melbourne for £150, and was eventually wrecked and sank in Keppel Bay off Queensland on 19 March 1869 (Rochampton Bulletin, March 23 1869). 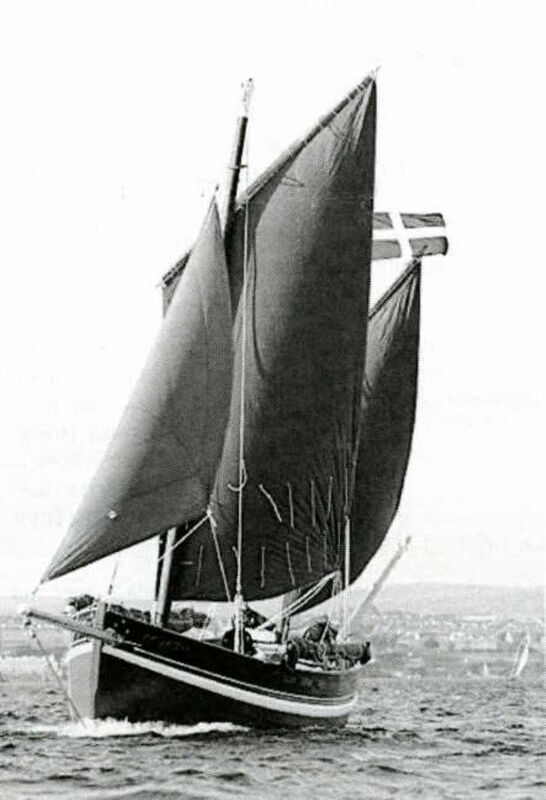 The story of the Mystery captured the public imagination and in August and September 1855 an account of the voyage with extacts from the log was published in the Wiltshire and Goucester Standard (15/9/1855), the North Devon Journal (23/8/1855), the Wells Journal (15/9/1855), Portsmouth Times and naval Gazette (8/9/1855) and Hereford Times (15/9/1855). By August 1855, when Richard Nicholls returned to Newlyn, Mystery was being referred to in the press as the world renowned fishing boat. 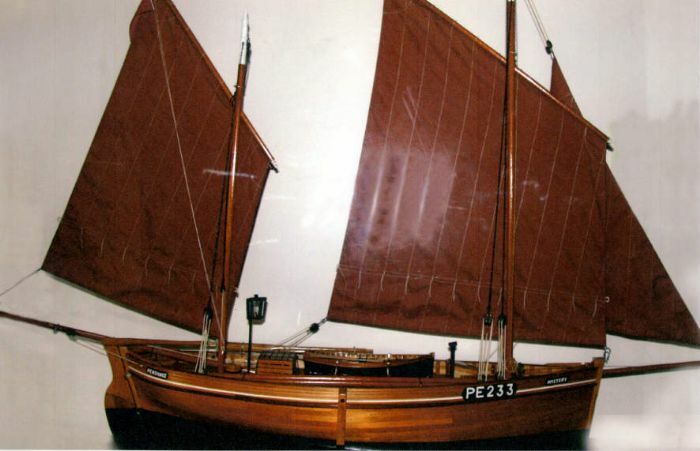 In February 1868, when Richard Nicholls died in London, the story was still big enough for it to appear in newspapers in Liverpool, Wiltshire and Devon while a short piece in the Shields Gazette (Tyneside) in 1866 makes it clear that Mystery and her crew set the standard for small boat ocean sailing.